The factcard is available in several ways (see below) so you can access the information in the best way for your needs. The CIPP policy and research team also provide regular in-depth reporting on pensions and payroll legislation changes through News Online and Professional in Payroll, Pensions and Reward. If you are not a member of the CIPP and wish to receive the payroll factcard, News Online, Professional in Payroll, Pensions and Reward magazine, and the many other benefits of membership, click here to join the CIPP. CIPP members will receive a handy printed copy of the factcard, to keep on their desks with the April issue of Professional in Payroll, Pensions and Reward. If you are a member and wish to order additional copies of the printed factcards please email us. The CIPP would like to thank Moorepay Payroll and HR Solutions for sponsoring the payroll factcard. 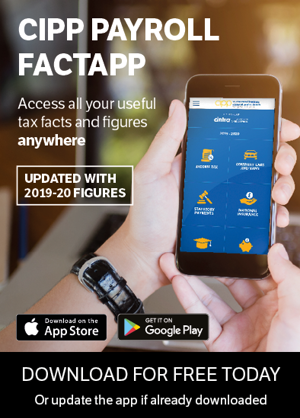 Available for both iOS and Android, the free CIPP payroll factcard provides quick access to your useful tax facts and figures from your smartphone or tablet. In addition to provided information for the current tax year, the app also provided details of previous tax years* for reference. To download or update the app, visit your app store and search 'CIPP. The CIPP would like to thank Cintra HR and Payroll Servces for sponsoring the payroll factapp.